What are the risk factors for TMJ syndrome? How do health care professionals diagnose TMJ syndrome? What is the treatment for TMJ syndrome? Are there any home remedies that provide TMJ pain relief? What types of doctors treat TMJ? 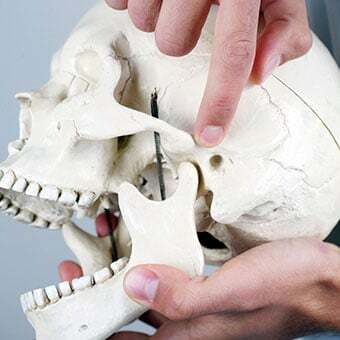 The temporomandibular joint is the joint that connects your jaw to your skull. When this joint is injured or damaged, it can lead to a localized pain disorder called temporomandibular joint (TMJ) syndrome or temporomandibular disorder (TMD). Causes of TMJ disorders include injury to the teeth or jaw, misalignment of the teeth or jaw, teeth grinding or clenching, poor posture, stress, arthritis, and gum chewing. TMJ disorders often responds to home remedies, including ice packs to the joint, over-the-counter nonsteroidal anti-inflammatory drugs (NSAIDs), avoiding chewing gum, massage or gentle stretches of the jaw and neck, and stress reduction. When home treatment does not work, medical treatment for temporomandibular joint (TMJ) syndrome includes dental splints, Botox injections, physical therapy, prescription medications, and in severe cases, surgery. 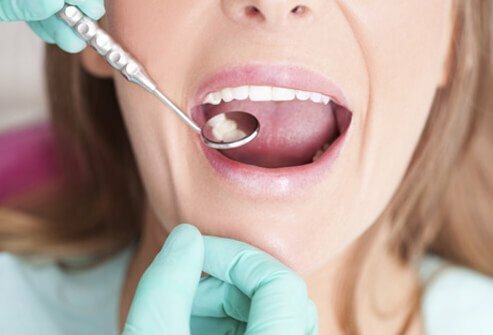 The prognosis for TMD is generally good as people usually can manage the disorder with self-care and home remedies. The temporomandibular joints are complex structures containing muscles, tendons, and bones. Injury to or disorders of these structures can all result in pain in the jaw area. Jaw pain may occur on one side or on both sides, depending upon the cause. Also depending upon the exact cause, the pain may occur when chewing or may occur at rest. Additionally, other medical conditions not related to the TMJ may cause perceived pain in the jaw area. Poor posture in the neck and upper back muscles may lead to neck strain and abnormalities of jaw muscle function. Stress may increase muscle tension and jaw clenching. Women 18-44 years of age have increased risk. Patients with other chronic inflammatory arthritis have increased risk. People with jaw trauma or poorly positioned teeth have increased risk. People who have a genetic predisposition to pain sensitivity and increased stress responses may be more susceptible. A doctor will diagnose TMD by taking the patient's medical history and doing a physical exam to find the cause of the symptoms. There is no specific test to diagnose TMD. A doctor may send the patient to an oral and maxillofacial specialist, an otolaryngologist (also called an ear, nose, and throat doctor or ENT specialist), or a dentist specializing in jaw disorders to confirm the diagnosis. 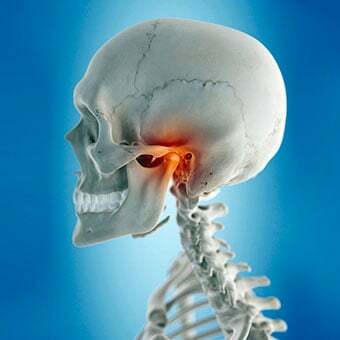 Sometimes a health care professional may order an MRI of the temporomandibular joint to detect damage to the cartilage of the jaw joint and to rule out other medical problems. A condition that may have some similar symptoms to TMD is trigeminal neuralgia. The trigeminal nerve supplies nerve impulses to the temporomandibular joint, and when irritated, it can cause facial pain. Other causes of face or neck pain include swollen lymph nodes (swollen glands), giant cell arteritis, salivary gland disease, sore throat, ill-fitting dentures, or dental braces. Some sedative essential oils (such as lavender, chamomile, sweet marjoram, and clary sage) may provide temporary relief from the pain and discomfort of TMJ. 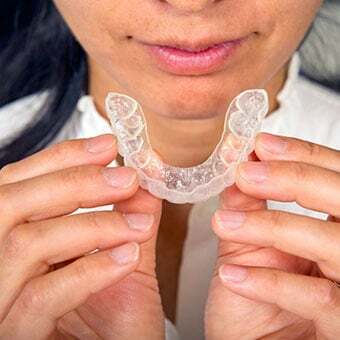 Dental splint (occlusal splint or stabilization splint or bite guard), which is a dental appliance placed in the mouth that keeps the teeth in alignment and prevents tooth grinding. This resembles a mouth guard and is usually prescribed and fitted by a jaw specialist. A medical professional may use Botox to relax the muscles of the jaw. However, this is not currently an FDA-approved treatment for TMD. Physical therapy with jaw exercises can strengthen muscles, improve flexibility, and range of motion. In states where medical marijuana is legal, a physician may prescribe it to help with severe TMJ pain. Biobehavioral management (biofeedback, cognitive behavioral therapy [CBT]) may help diminish pain intensity. Trigger point acupuncture can sometimes be helpful. In severe cases, surgery on the jaw or dental surgery may be necessary. TMJ arthroscopy or arthrocentesis is a minimally invasive procedure usually done in an outpatient setting. Recovery time for this procedure is about a week. Sometimes a total joint replacement may be necessary. This generally requires a stay in the hospital for several days, and surgery recovery time is four to six weeks. A primary care provider (PCP), such as a family practitioner, internist, or a child's pediatrician, may first diagnose your TMJ. Your doctor may refer you to an oral and maxillofacial specialist, an otolaryngologist (also called an ear, nose, and throat doctor or ENT specialist), or a dentist specializing in jaw disorders (prosthodontist, also called a prosthetic dentist) for further treatment. You may also see a pain-management specialist if your TMJ pain is severe. The prognosis for TMJ syndrome is generally good. There are numerous causes for TMJ syndrome, so the outlook depends on the cause, if known. Most people can manage the discomfort with self-care and home remedies. Complications of long-term TMJ syndrome include chronic face pain or chronic headaches. In severe situations, where pain is chronic, or associated with other inflammatory disorders, long-term treatment may be necessary. Symptoms of TMJ syndrome tend to be episodic and related to stress and lifestyle. using proper safety equipment to prevent jaw fractures and dislocations while exercising, working, or participating in sports. 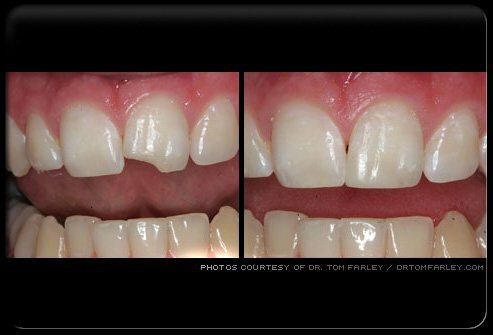 American College of Prosthodontists. 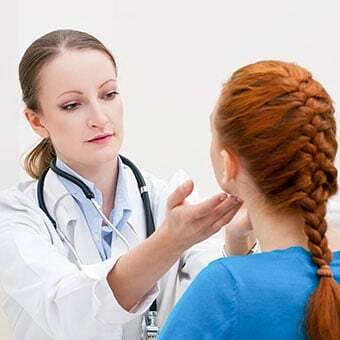 "Temporomandibular Joint Disorder & Facial/Jaw Pain." <http://www.gotoapro.org/temporomandibular-joint/>. Scrivani, J., and Noshir R. Mehta. "Temporomandibular Disorders in Adults." UpToDate.com. Feb. 2019. <http://www.uptodate.com/contents/temporomandibular-disorders-in-adults?source=search_result&search=tmj&selectedTitle=1~77>. "Study Evaluates Risk Factors for Chronic Temporomandibular Joint and Muscle Disoders." National Institute of Dental and Craniofacial Research. 10 Nov. 2011. "TMJ." Amerian Academy of Otolaryngology - Head and Neck Surgery. Dec. 2010. The TMJ Association. "Arthroscopy." June 18, 2014. <http://tmj.org/site/page?pageId=263>. "TMJ Disorders." National Institute of Dental and Craniofacial Research. Aug. 2013. TMJ Hope. "TMJD Pain Management." <http://www.tmjhope.org/tmj-treatment/pain-management/>. Besides pain, what TMJ symptoms do you experience? What treatment have you had for TMJ? Have you tried exercises or other self-care measures to prevent TMJ symptoms? What kind of activities exacerbate your TMJ pain? What causes your TMJ symptoms?